support area high school ski teams. but we encourage you to utilize Friday nights check-in. We accept downhill, cross country and snowboard equipment, ski racks, ice skates and roller blades. Bindings are accepted but must be mounted to a board. Clothing, accessories and helmets are also accepted. The club will only accept serviceable and sellable equipment. Please, no long straight skis. 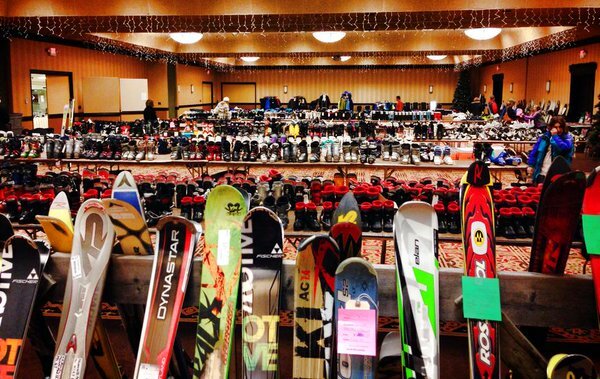 Antrim Ski Academy will take a 20% commission on all sold goods. We have lots of quality equipment available all day Saturday and have a good selection of kids skis and boots throughout the sale. If you can’t make it early, you will still have the opportunity to find some really good deals. Any equipment not picked up will become the property of Antrim Ski Academy and may be disposed of. Sorry, no exceptions. We will mail out any checks that are not picked up. Funding 100% of our scholarship programs. Each season ASA accepts 10-15 scholarship students into our programs, at no cost to the scholarship recipients. Purchase of new equipment for ASA, including gates, training gates, timers, etc. Offsetting the costs of ski and snowboard clinics. The fees charged for most of our programs do not cover the direct costs of coaching and additional funds are required. In exchange for assisting in running the swap, ASA donates a portion of the swap proceeds to area high school ski teams.